We commit to building the highest precision custom tooling and repeatability throughout mold life. 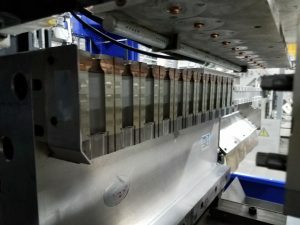 While the quality and cost of both blow-molded and injection-molded products depends on a variety of factors, the design and quality of the tooling or molds are a prime factor in the scope of any successful program. Currier Plastics has developed a strong group of mold-making partners that are located both domestically and internationally. These dedicated artisans represent the best in precision and quality tool building. These suppliers also help us target the best lead times and costs when we quote new tools for our customers. Our designers and engineers work hand in hand with each of these selected partners when building our custom molds. The communication between the Currier Plastics team and our mold builders uses the most modern advances in CAD/CAM systems to produce innovative blow-molded packaging and high-tech injection mold designs. There is a seamless correlation from part design to computer-assisted machining centers cutting tool steel and aluminum. Currier Plastics has promoted a high standard of quality in our mold requirements and our mold-building partners take pride in the close tolerances and highly finished surfaces that have built our reputation for excellence in manufacturing. This confidence and diverse supply base frees our own in-house tool room department to focus on scheduled preventive maintenance that assure our customers on-time production requirements.